The Lenox Shirtdress is a classic fit-and-flare shirtdress, with features that have been thoughtfully designed to look absolutely fantastic on curves (and of course, it’s in our usual sizing of 12 – 28 and cup sizes C – H). 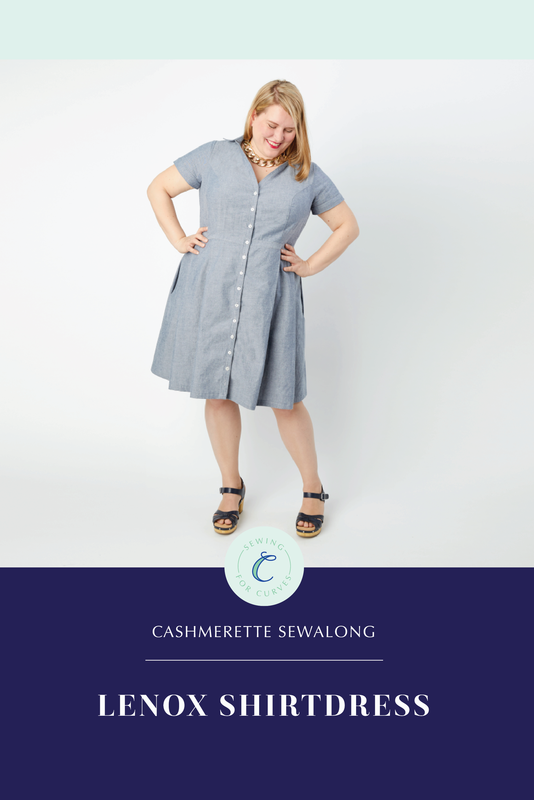 What makes the Cashmerette Lenox Shirtdress stand out? A gentle V-neck button placket frames your face and looks great on a larger bust. The princess seams on the front and back bodice mean an amazing fit. Short sleeves with a separate hem band. Two collar versions: a traditional collar, or a simple band collar. Two skirt versions: a lovely swishy pleated skirt (which is positively sculptural in mid-weight fabrics) or a simple gathered version. Back princess seams with a built-in sway back, so no fabric pooling in your lower back. A separate waistband which hits at the high waist, and looks equally great with or without a belt. This sewalong will take you through each step, but if you want even more instruction, check out our Shirt Making for Curves online workshop, which will walk you through many of these steps in great detail!